Elizabeth Hollenbeck was born in Germany in 1827 and married John Hollenbeck in 1853. 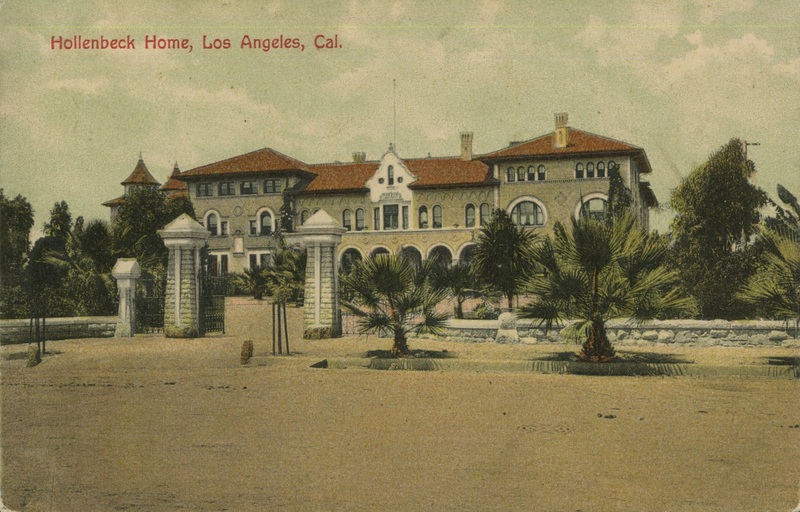 After living in Costa Rica for many years (which included running an outpost that catered to traders) the Hollenbecks moved to Los Angeles in 1876 and made a fortune in hotel and land development. The public rooms on the opening day were described as large, sunny and airy. They were “sensibly” furnished and there was a mix of potted palms and flowers scattered throughout. A life size portrait of Mr. Hollenbeck was prominently displayed and draped in smilax. Over 1,000 people attended the dedication ceremony which was held outdoors on the Hollenbeck grounds. The program included speeches by various dignitaries including Elizabeth Hollenbeck. The speeches were interrupted with musical interludes and prayers including The King of Love sung by the First Presbyterian Church, the Lord’s Prayer chanted by the choir, an invocation delivered by the Reverend Mr. Chase and Nearer My God to Thee sung by Miss Edna Bicknell. The administration building at the Hollenbeck Home housed the administration offices, a dining room, a kitchen and a parlor. In the north wing there was also a “modern hospital” with a trained nurse and a doctor, C. W. Evans, who was on call. The dormitory wing not only had rooms for the residents but a library and a “modern laundry.” Twenty of the dormitory rooms were furnished but the others were only carpeted so seniors could bring their own furniture if they liked. The grounds also contained a chapel with stained glass windows. The windows in the front of the building faced the mountains. The windows at the back of the building faced downtown. 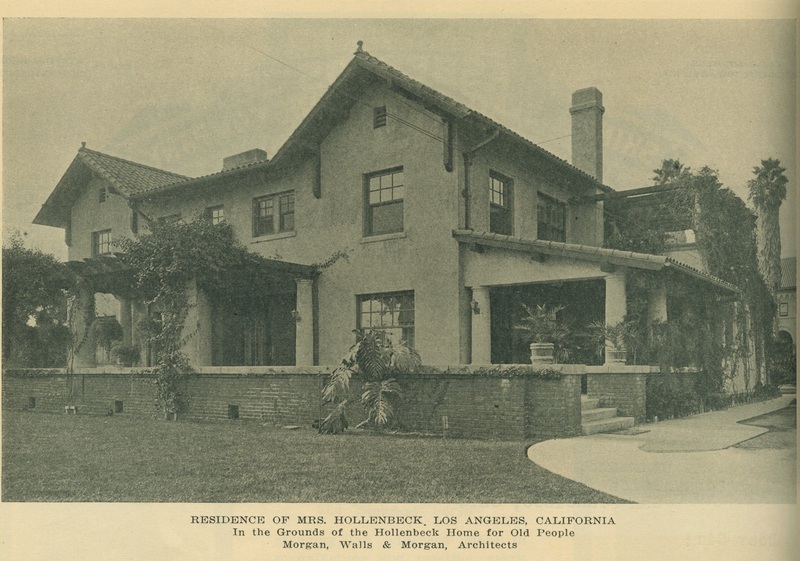 The cost to build the Hollenbeck Home was $55,000. 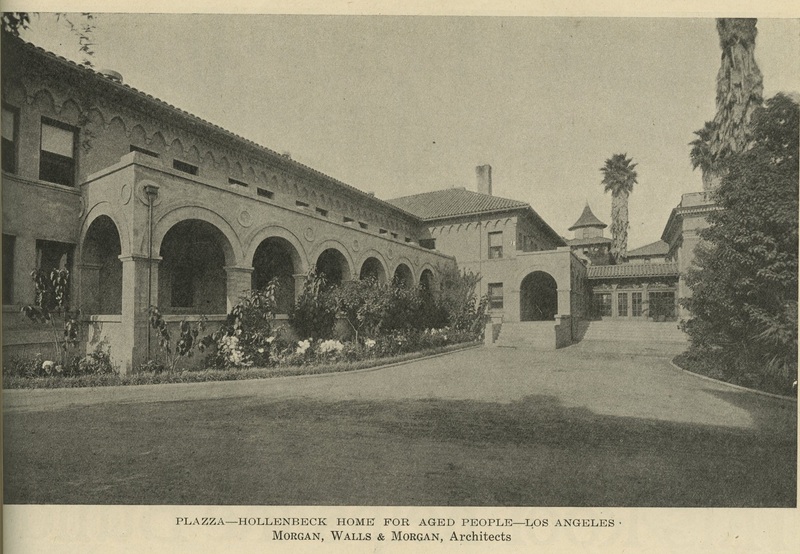 In some of the images below the Hollenbeck is referred to as a Morgan, Walls & Morgan building but the son of Octavius Morgan, who was named Octavius Weller Morgan and the second Morgan in that string of names, was only ten years old when the Hollenbeck opened in 1896. 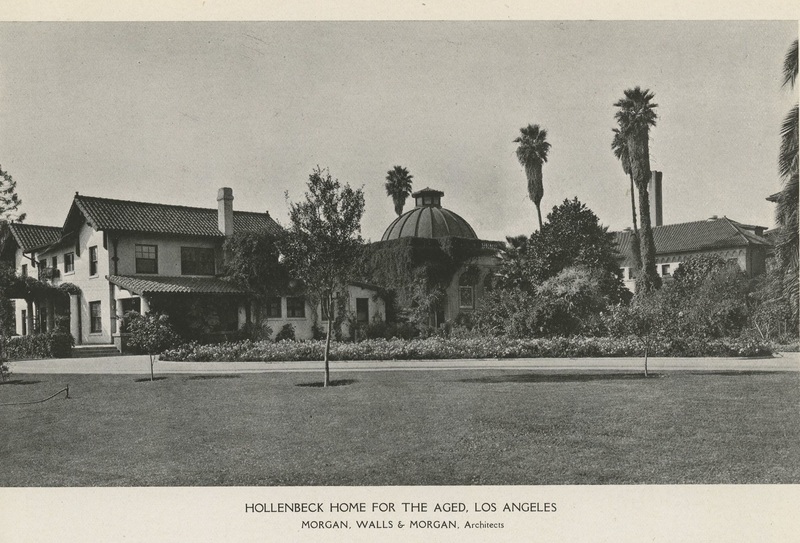 The Morgan & Walls’ Hollenbeck Home for the Aged was torn down in 1985. 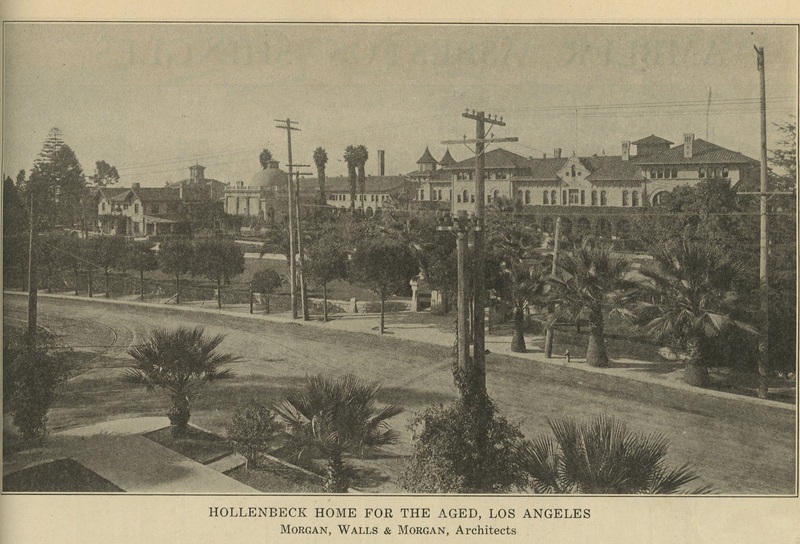 The Hollenbeck on a postcard. This image and the three that follow were in advertisements for clay roofing tile. 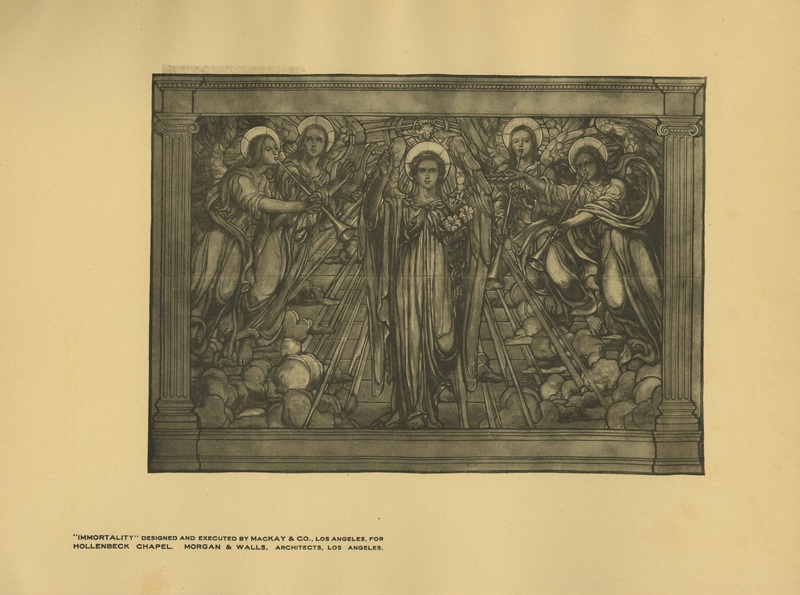 I found this in the Architectural Yearbook from 1910. A history of California and an extended history of Los Angeles and environs. (1915). Los Angeles: Historic Record Company. For aged persons. (1896, July 31). Los Angeles Times, p. 12. For the aged. (1896, September 7). Los Angeles Times, p. 10. Hollenbeck Home for the Aged advertisements. (1919, April). Building Review, 17(4). Note: I have a book coming out in the latter half of 2018 from The History Press titled: The Architects Who Built Southern California. It will be 10 chapters with each chapter devoted to a different architect (or architectural firm) including: Harrison Albright, John Austin, Claud Beelman, Elmer Grey, Hudson & Munsell, A. C. Martin, Meyer & Holler, Julia Morgan, Morgan Walls & Clements and Alfred F. Rosenheim.